Apple has dramatically overhauled its iPad lineup in the last two years with the ultra-thin iPad Air and super-small iPad mini. So where could the company go from there? The iPad Air 2 and iPad mini 3 revealed at Thursday’s media event are even slimmer than before and look more like the iPhone with a new gold hue and Touch ID. The improved iPads aren’t game-changers by any means, which may upset analysts who have pointed to declining iPad sales as a sign that Apple needs to do more to rejuvenate its lineup. The company sold 13.3 million units in the third quarter, a 9 percent decline from 14.6 million sold in the same quarter last year. But iPads are still big business: Apple CEO Tim Cook announced Thursday that the company has sold more than 225 million iPads around the world since launching its first tablet four years ago. iPads outsell PCs every quarter. Two iPad Air 2s stacked on top of eacher are still thinner than an original iPad. 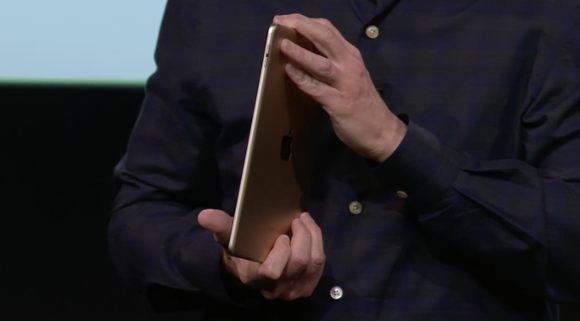 First, you shave it down to 6.1 millimeters, 18 percent thinner than the first-gen iPad Air. If you stack two of the new iPad Airs on top of each other, they’re still thinner than the original iPad. The iPad Air 2 also has anti-reflective coating, which reduces glare by 56 percent. Then you add a new chip. 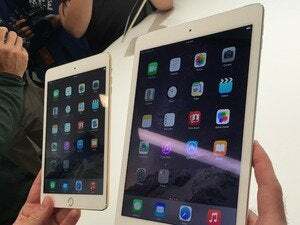 The A8X chip developed for the iPad Air 2 is a variation of the A8 chip created for the iPhone 6 and 6 Plus, making the new tablet’s graphics 40 percent faster. Its Wi-Fi connectivity is also faster, thanks to the inclusion of the latest 802.11ac technology. The second-gen iPad Air has the same M8 motion co-processor baked into the new iPhones, which is used for tracking activity and even has a barometer for measuring elevation (because hiking is exercise, too). The new iPad also has improvements for photographers. The new 8-megapixel iSight camera can shoot photos in Burst mode (even selfies), take panoramas, has an improved FaceTime HD camera, and records 1080p videos. The company also showed off the iPad mini 3, which also gets a Touch ID upgrade and new gold gloss. The iPad Air 2 and iPad mini 3 are optimized for online shopping with Apple Pay, though can’t be used for in-store purchases, because they lack the necessary NFC technology. These improvements were all expected. Even the names of the tablets came as no surprise after Apple accidentally posted screenshots of its iPad User Guide for iOS 8.1 on Wednesday. But updates like these are necessary to get the iPad on the same playing field as the iPhone. Apple Pay is expected to become a major force in mobile payments, and all iOS devices need to enable purchases for the sake of continuity (not Continuity). 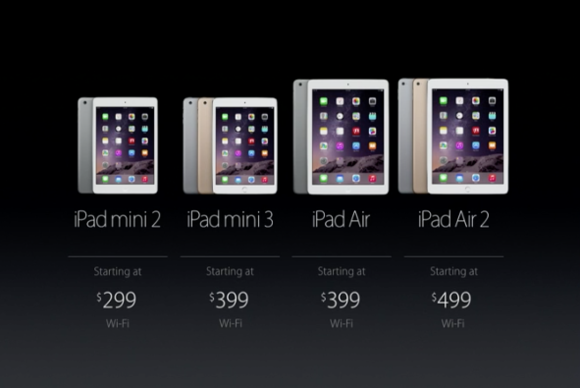 Apple starts taking preorders for the iPad Air 2 and iPad mini 3 on Friday, Oct. 17. The iPad mini 3 starts at $399 for the 16GB model. You can get 64GB for $499 and 128GB for $599. The iPad Air and iPad mini 2 aren’t going away. Neither is the original iPad mini, which now retails for $249. Which iPad are you ordering? Let us know in the comments.